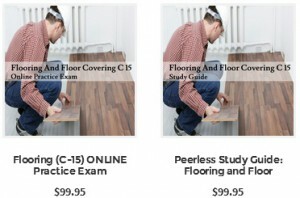 Are you wondering how to become a licensed flooring contractor? Before you can apply for your licensure, it would be wise to take care of the educational requirements first. Even though this occupation does not require a formal degree, you should consider getting an associate degree in business management, since independent contractors are practically small business operators. An associate degree program would teach students the main concepts of operating a business, including the management of human resource, information and finances. In addition to getting a degree, you can also opt for some on-the-job training. According to the US Bureau of Labor Statistics, carpet and flooring installers typically do not have any formal training. It is not even required by most employers in this field that workers come in with a lot of professional experience. Rather, these workers are expected to learn all the skills they need on the job. They start out as helpers and go on to become more experienced workers. With the passage of time, the complexity of the work they get assigned increases. In case of a large employer, you might even get the opportunity to complete a sponsored apprenticeship program. Acquire 4 years of experience in the trade for which you plan to get the license for. Working as a contractor, journeyman, foreman or a supervisor would help you meet the experience criteria. After this, you will have to take two exams: the California Law and Business Exam and the Flooring & Floor Covering C-15 exam. To take this exam, you will first need to apply through the Application for Original Contractor’s License and pay the application processing fee of $250. An addition $150 in fees would have to be paid after both exams have been successfully passed. Once you receive the notification for the approval of your application, you will need to submit fingerprints for a background check. You will also be required to meet additional financial requirements: $2,500 in working capital for flooring projects; contractor surety bonds of $7,500 and $12,500. Along with these financial concerns, you will also be required to provide workers compensation insurance if you plan on hiring other individuals. Once you have gathered the relevant experience and gotten hold of your practicing license, the next step is to become an independent carpet and flooring contractor. In addition to the duties pertaining to the flooring contractor’s job description, you will also be taking care of business and finance matters. Supervising, coordinating, installing and monitoring tasks become an addition to their existing job descriptions. After you have established yourself as an independent contractor, the next order of business can be developing and expanding your clientele. To keep your business afloat, you will need to invest time and money into building a strong customer base. Marketing techniques such as advertisements, flyers and newspaper ads might help you become more visible to your desired market segment. Obtaining a flooring contractors license is not a simple or small process. But it is certainly worth your time and money. Once you have established your expertise in the market, you will most likely be a highly sought-after professional.